A person trapped in their smoking car after a two-car crash this morning (Wednesday July 7) near Kineton had to be rescued by firefighters. The crash happened on the B4086 near Lighthorne Road just before 8am. Crews arrived to find no fire but found one of the crash victims trapped in their vehicle. Specialist cutting equipment was used to free the victim, who was then left in the care of West Midlands Ambulance Service. 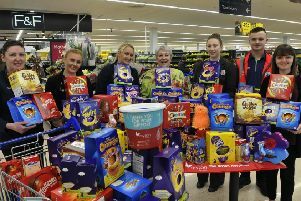 Leamington and Warwick Tesco stores donate Easter Eggs to Myton Hospice tombola.